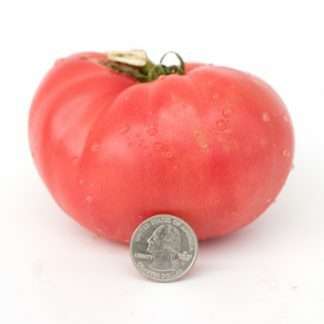 Dwarf Tomato Project description: Dwarf Franklin County (Wishful family) – 75 days – Patrina Nuske Small created the Wishful family in 2007 by crossing what ended up being a crossed plant of Farmers Market Bicolor with Dwarf Recessive (cross). Susan Oliverson did the majority of the work on this line and selected and named Dwarf Franklin County. Other contributors are Craig LeHoullier, Jeff Bayes, and Jay Scott, with seed production carried out by Bill Minkey. 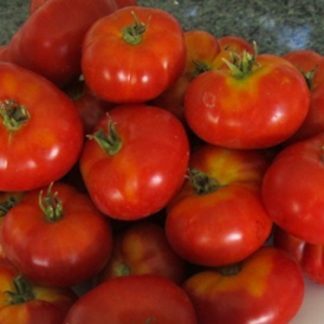 Potato leaf dwarf, 2-4 oz oblate red mini beefsteak (consider it a large distinctive cherry tomato), high yield and very nice flavor. 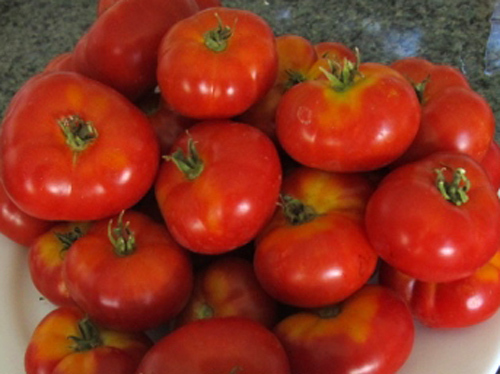 From Bill Minkey’s notes: “Dwarf Franklin County” is a 2-4 oz., oblate, red, mini-beefsteak, large cherry. Yield is very high and flavor is very good to excellent.